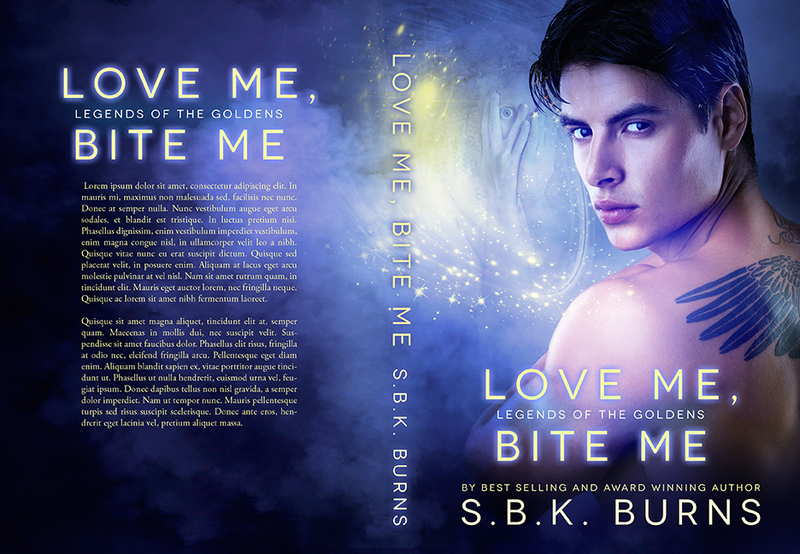 COVER REVEAL: LOVE ME, BITE ME | S.B.K. Burns' Sci-Fi Romance . . . . . . . . . Science & Spirit . . . . . . . . . . . . . . . . . . . . . Heroines with Attitude. . . . . . . . . . . . . . . . Heroes with Heart . . . . . . . . . . . . . . . . . . .
LOVE ME, BITE ME, the second book in the LEGENDS OF THE GOLDENS SERIES is in PRE-ORDER for 99 cents at Amazon. It’s the continuing story of Chastity (from A FAR FAR BETTER THING free on Kindle and Nook), the human/Golden hybrid that has the Golden community on edge. She’s fallen for her high school quarterback, who has decided to become officially changed into a vampire at San Diego’s Comic-Con. If she bonds with him before that, she might save his soul, but poor Chastity doesn’t even know how to kiss. So she finds a Zander of the future to practice bond on. Unfortunately practice Zander falls for her and has to compete with her real Zander of his past. Chastity also appears in subsequent books in the series published by Soul Mate: FORBIDDEN PLAYGROUND and DANCING DRAGONS. She’s the wise Golden elder aunt to her nieces and nephews, the main characters in those books. And she appears prominently with Zander in DANCING DRAGONS. This entry was posted in fangs, paranormal, sci-fi paranormal romance, series, time travel, urban fantasy, vampires and tagged futuristic, light urban fantasy, new adult, new adult paranormal, new adult sci-fi romance, new adult science fiction, psychic, shape-shifting, shapeshifter, shifters, Soul Mate Publishing, telepath, teleportation, time travel, urban fantasy, vampires by doctorsatori/S.B.K. Burns. Bookmark the permalink.